Bangkok (Thailand) – June 26, 2018 (travelindex.com) – Mrs. Nichapa Yoswee, Vice President of Business of TCEB said that “Meetings and Incentives (MI) sector is a significant contributor to Thailand’s MICE industry, generating approximately 50% of the industry’s total revenue. The recent statistics in the first-half of this fiscal year show that MI sector delivered the highest growth rate. Meeting sector (M) alone welcomed 150,849 business travellers, or 11.81% increased from the same period last year. Incentives sector (I) welcomed 176,005 business travellers representing 21.63% growth. 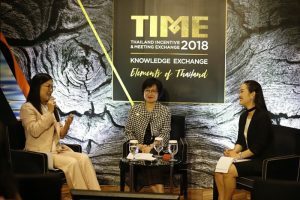 The three primary activities at TIME2018 are: 1) Knowledge Exchange, conducted on June 19 under a concept of ‘Element of Thailand’. This knowledge platform focuses on enhancing competitive capabilities and market insights. It helps participants to learn about the target markets including business environment and trends, politics, economics, tourism, policies, regulations, as well as key factors that influence customers’ decision on choosing meeting and incentive destination. 2) Business Exchange, this networking platform is also organised on June 19 in the style of ‘Social Club’. It allows 30 buyers from Long Haul markets to meet with Thai MICE operators in four different settings which reflect Thailand’s meeting destinations. These themed settings are: Beach – the theme demonstrates the ideal creative atmosphere of business meetings in Thailand’s beach resorts; Nature – the themes feature sustainable MICE events; Culture – the themes highlight the uniqueness of Thai culture; and City – the themes demonstrates Thailand’s MICE capabilities in major MICE Cities. And 3) Experience Exchange, this activity is a familiarisation trip organised under the theme ‘Global Exchange for Change’ during June 20-23 in Koh Samui, Surat Thani. It is aimed at showcasing Koh Samui’s capabilities in accommodating small and medium-sized MI groups with numbers of 50-100 delegates. It creates a direct experience and highlights a luxury theme to expand new marketing opportunities for the local operators. During the trip, participants will get a chance experience CSR and Team Building Activities. TCEB expects that this activity will generate more business opportunities for Koh Samui, principally from the premium MI markets. It is estimated that TIME 2018 will create a trade value of 170 million baht. Mrs. Nichapa added, Besides TIME2018, TCEB is introducing a promotional campaign so-called ‘Meet by Design’ which is specially created to attract MI groups. Promotions include: Meet Now – facilitations and supports will be provided to MI group with a minimum attendance of 50 delegates and a minimum stay in Thailand for three nights, and Meet Smart – 100,000 baht support will be provided to MI group coming from five targeted industries under the Thailand 4.0 Policy. The eligible group must have a minimum attendance of 50 delegates and organise at least two full-day meetings at a venue certified Thailand MICE Venue Standard. Throughout this year, TCEB joins a series of leading exhibitions for Incentive travel and Meetings to promote Thailand MICE industry in Long Haul markets. The bureau creates Thailand Pavilion at the IMEX Frankfurt 2018, IMEX America 2018, and IBTM World 2018 in Spain. Furthermore, sales and marketing missions are conducted in major cities including Paris, Sydney, and Melbourne as well as cities in the midwestern United States namely Dallas, Minneapolis, and Chicago.